Apowollastonia spilanthoides was until 2013 (Nuytsia 13) known as Wedelia spilanthoides. This herb may be erect or prostrate often rooting at the nodes and there are rigid hairs on the stem. Leaves are opposite, narrow usually less than 1 cm wide. Flowers in heads with yellow ray florets and yellow disk florets in the centre, the receptacle is more or less flat. This is in contrast to a species with a similar appearance Acmella grandiflora where the receptacle is cone shaped and there are no rigid hairs on the stem. Pappus is minute in both species. 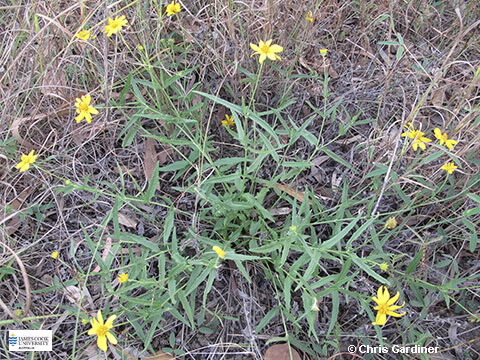 Other formerly Wedelia species in North Queensland are Apowollastonia longipes which ovate leaves rather than narrow ones and the annual herb found west from about Hughenden A. cylindrical.